 This much ballyhooed book starts out slowly and seems derivative. Much of the information throughout the text is derived from the newspaper and magazine reportage of other journalists; and another author, Richard M. Clurman, beat Bruck to quite a bit of the drama two years ago in To the End of Time (1992). But despite these obstacles, Bruck manages to compose an interesting book, even though her subject is inherently less interesting than Michael Milken, the key player in Bruck's previous book, The Predator's Ball (1988). Milken was involved in high- stakes criminal conduct; Ross (who by the book's publication will have been dead nearly a year and a half) was pretty much just one more in a long line of greedy, unintrospective tycoons. He was a born dealmaker, a one-time traveling salesman who parlayed his in- laws' lucrative funeral-home business into a diversified company, which he took public in 1962. In 1969, Ross made a surprise bid for Warner-Seven Arts and found himself hobnobbing with the likes of Frank Sinatra. 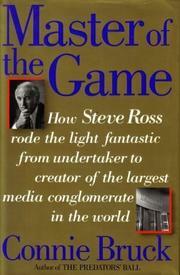 Two decades later, in 1990, Ross helped engineer the megadeal of his life--the merger of Warner with Time Inc. to create the largest communications/entertainment company in the world. Bruck's quotation from opera star Beverly Sills, who spoke at Ross's funeral, sums up the life neatly: ``He was like an opera singer. He was larger than life; he knew how to make grand entrances; he knew he didn't have to yell at the top of his lungs to keep an audience's attention; he was always on a diet; and he knew how to share curtain calls.'' In an age of biographers acting as pathographers, Bruck is refreshingly generous in spirit. The book is not a valentine, but Bruck explains Ross's good qualities as well as his bad. By retaining her mental balance about her subject, Bruck allows the reader to enjoy mental balance as well.